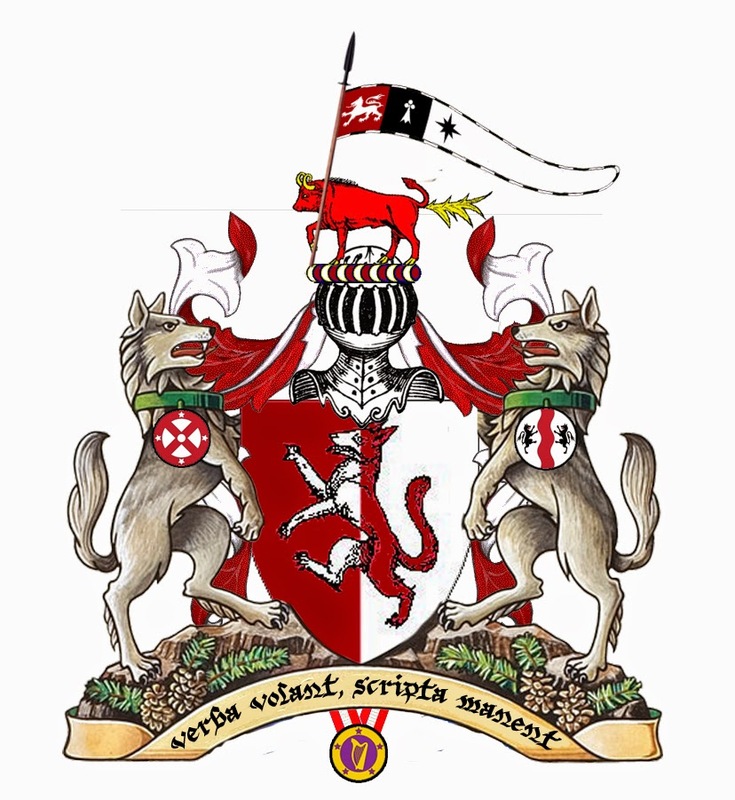 Aaaand another change to my achievement of arms, adding the badge for the Award of the Orion. Many, many thanks to all those who came out, who did me the honour of crossing blades with me, who came to witness the event, or who assisted in running the deed. Special thanks to His Majesty Ealdormere who acted as the king-of-arms, to Her Majesty Ealdormere who was the inspiration, to Magistra Nicolaa who acted as the deed's herald, THL Jocelyn Cranewell who acted as scribe, and to Anton who served as my man-at-arms. Just, stout blows were given and received, as were tokens. Honour flowed like water. 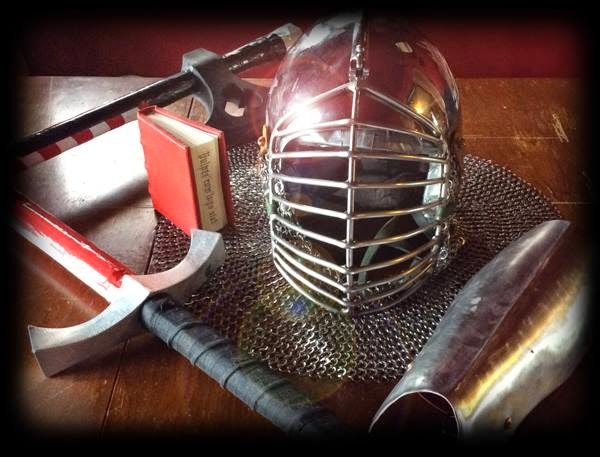 Though all who took part fought well and good, only one could be awarded the prize--a greave made by my own hand. 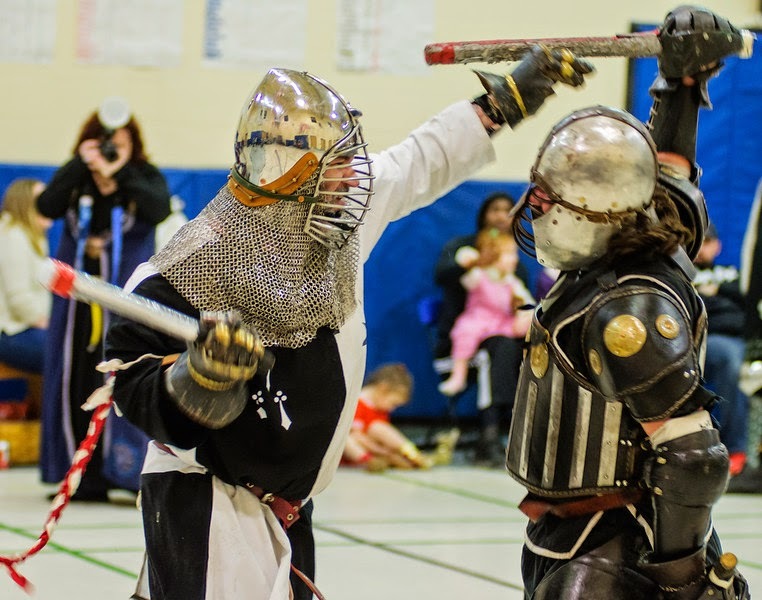 The judges (TRMs and Nicolaa) declared that the one fighter who had shone brightest with chivalry, courtesy and prowess had been THL Hans Thorvaldsson. I love this style of fighting, and hope to see more deeds and pas d'armes occur in the future. If you missed this one, there will be at least two coming this summer. One will be hosted by the White Bear Fian at Pikeman's Pleasure, and the other will be hosted by Lord Fulk at the War of the Trillium. Photo by THL Eirik Andersen. I've seen so many things, and I've been able to do so many things, I otherwise would not have...how to choose just one? I have gained fond acquaintances, good friends, belt-sisters, raven-family, squire-brothers, sword-brothers, peers that truly inspire me...what one interaction with them can sum up the whole? Was it emerging from my tent at my first ever War Practice (precursor to War of the Trillium) to find an empty camp save for a three year old Adelaide who had likewise risen early, sitting down by the firepit and having a fully fledged conversation with her? This being the same Adelaide I have had the opportunity to see blossom into a wonderful young lady, who once danced the colour purple for me, who loves animals in all shapes and sizes, and who is like a niece to me. Is it my first Pennsic War﻿, driving down the highway and suddenly seeing the sea of tents appear? Wandering the merchant area later one night and watching a shadow puppet show? 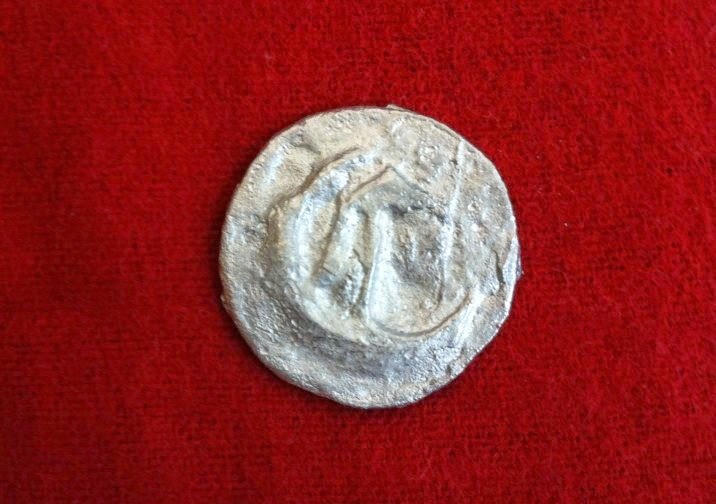 Being accosted by street performers, spotting a leper, being winked at by a performer, scouring the stalls for a pennanular broach and finding one in literally the last shop? 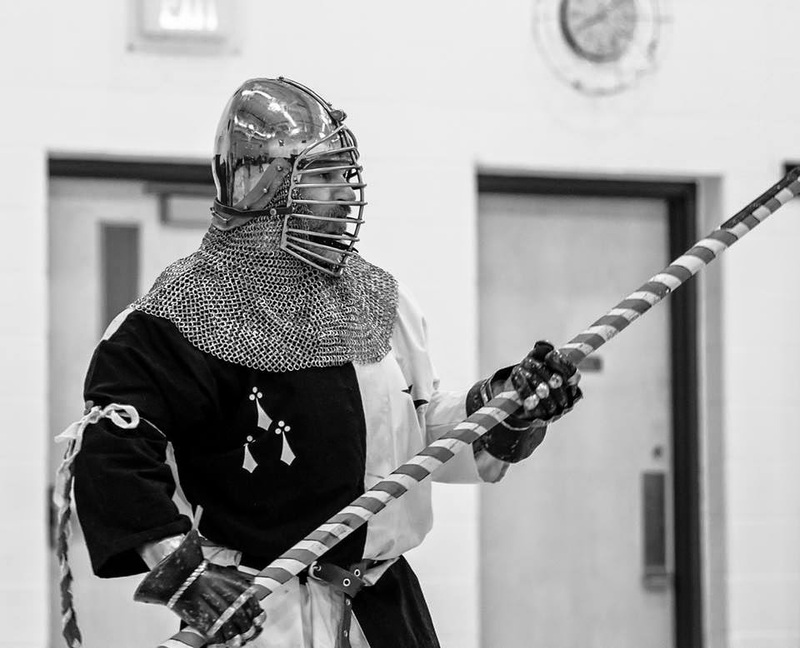 Was it the first time I fought in battle at Pennsic War, where I stood with my fellow Isengesethr with Baron Cynred at our head, iron rings on our arms, clashing our shields and raising our voices in songs of glory and homeland? Was it returning from War and singing Home as we crossed the bridge back into Canada? Was it going to our first event, in fully researched garb we had made ourselves, and being praised by the Queen and Baroness Gaerwen, who told our canton seneschal we were keepers? Is it this week, seeing just how many pictures of Gulf Wars feature my fellow Ealdormereans, especially our King and Queen Nigel and Adrielle, showing their nobility, strength at arms and grace? Was it the pride I felt when first becoming a squire to Sir Evander and the joy it brought (even though that relationship would eventually end)? Was it the renewed validation, and showing of my triumph over some of my personal demons, when I later took a knee and became Sir Nigel's fourth squire? Was it when Adrielle took me on as an apprentice, proving to me that I had worth in the fields of the arts and sciences, and making me a member of House Arrochar on both sides of the family? Was it taking part in the handfasting of my best friends and housemates, Master Berend and HE Mahault, one quiet night in the swamp at the Pennsic War? It was all of these, it was more than these, it was everything. So much of the good in me has been forged by the people I've met and the experiences I've had in the SCA. To all of you, I give my humble thanks. Within the SCA I have a number of different and meaningful relationships that have developed over time. Firstly, I am squired to a knight. With that I gained a number of squire-brothers. I am also an apprentice, and that garnered me a gaggle of feral belt-sisters. My knight and laurel are married and have a joint household, but I am also a member of another household, symbolized by the raven. Due to that I have my raven-brothers and -sisters. This, as anyone who has been in the SCA for any period of time can tell you, is pretty standard. The first of them were His Excellency Berend van der Eych, who at the time was squired to Duke Finnvarr de Taahe (though now both he and I are squired to Sir Nigel). So he is both a squire-brother and a sword-brother, and chiefest of this company. This was followed by Sir Wat of Sarum (who was not even a squire at the time), THL Amelius Claudius Rattanicus and Lord Edward dit Lyon. 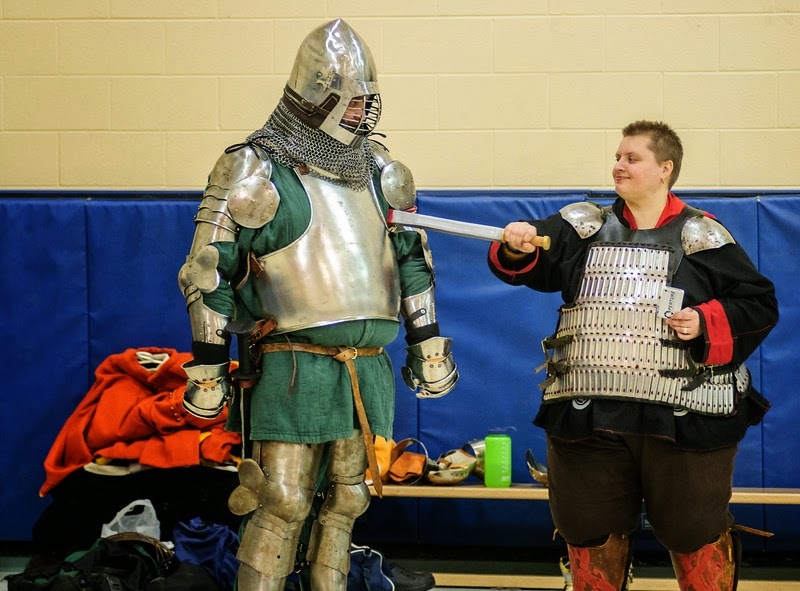 At a non SCA (but SCA related) event this past weekend, I approached another fine noble, and told him how I have come to admire him as he has grown and evolved over the past few years. He is always striving to improve himself and his game, has taken on thankless jobs which he handles with aplomb, and is quite frankly an excellent human being. I asked him to stand as a sword-brother, and he agreed. I am proud to include Lord Fulk Beauxarmes among my band of stalwart friends and comrades. To symbolize our bond, I give each of my sword-brothers a sword (though it may be miniature in size). Fear not, Fulk; your's will be forth-coming. * I should add, that the two people who said no were already a raven-brother and -sister and felt no further proof of bond was required.